The Bureau of Criminal Investigation and Identification was at a house in South Webster last summer. It is believed to be connected to at least one suspect who was arrested Tuesday in the Rhoden murder investigation. While law enforcement made clear during a press conference Tuesday, they feel they have in custody the persons responsible for the massacre of the Rhoden family in Pike County on or about April 22, 2016, officials are being somewhat mum about the motive or motives behind the massacre of eight people. Appearing in front of a horde of reporters, Ohio Attorney General Mike DeWine, Pike County Sheriff Charlie Reader and Pike County Prosecutor Rob Junk largely waved off questions regarding the motives of the four primary suspects in the 2016 murders, all of whom were arrested earlier this week. “Because this is an open prosecution, we won’t be able to say much about motive, but you’ll see from the indictments that custody of that young child plays a role in this case,” said DeWine, who is, of course, also Ohio’s governor-elect. As the DailyTimes reported yesterday, DeWine described the case as “bizarre” and stated the suspects, all members of the same family, seemed obsessed over the custody of a child identified by Attorney General’s office spokesman Dan Tierney as Sheila Wagner. According to the indictments posted on the Attorney General’s website, all four of the primary suspects are facing over 20 criminal counts each, to include one count of aggravated murder for each of the eight victims. Suspect Edward Jacob Wagner also faces a fourth-degree felony count of unlawful sexual conduct with a minor. The indictment alleges Edward Wagner engaged in sexual conduct with one of the victims, Hannah May Rhoden, further alleging Edward Wagner was 20 at the time he had sexual contact with Hannah Rhoden, then 15. Tierney named Edward Wagner the father of Sheila Wagner, who he said was age three at the time of the murders. The Rhoden murders took place at three different homes in Pike County. The perpetrators spared the lives of a trio of children who were in the homes at the time of the murders. Those children included a three-year-old, six-month-old and five-day-old infant. Sheila Wagner was staying with the Wagner family at the time of the deaths, according to a press release from the attorney general’s office. Tierney said state child services is handling the disposition of Sheila Wagner and she is presumably in their custody. Besides Edward Wagner, 26, those arrested and charged directly with the murders were George Washington “Billy” Wagner III, 47 and his wife, Angela Wagner, 48. Edward Wagner is their son and brother of the fourth suspect, George Wagner IV, 27. In addition to the Wagners, two other persons were charged and arrested in connection with the crimes. Rita Newcomb, 65, and Fredericka Wagner, 76, are both grandmothers in the Wagner family and both are charged with allegedly attempting to cover up any criminal activity. Arrested at her home in Scioto County, Newcomb is Angela Wagner’s mother. Fredericka Wagner was arrested in Lucasville and is the elder George Wagner’s mother. Counts one through three of the indictment against Newcomb detail her alleged forging of a custody document involving Hannah May Rhoden, count one, Edward Wagner, count two, and George Wagner IV, count three. Tierney said the child named was Sheila Wagner. The indictments charge the document produced purported to be genuine “when it actually is spurious” or falsified to appear to be a copy of an original when no original exists. Each of the four main murder suspects also are charged each with one count of forgery of custody documents, which allegedly took place in early April 2016. Newcomb also was charged with one count each of obstructing justice and perjury. The latter indictment claims on or about July 18 Newcomb knowingly made false statements to a Pike County grand jury. Fredericka Wagner also faces one count each of obstructing justice and perjury, the latter for allegedly lying to a grand jury in Pike County July 24. The lengthy indictments against the four main suspects read largely the same. Each suspect is charged with one count of murder for each of the eight victims. Those charges all carry death penalty specifications. Other charges against the suspects include aggravated burglary (apparently connected with illegal entrance of the homes at which the murders were committed,) obstructing justice and tampering with evidence. Although he did not reference specific parts of the indictments during Tuesday’s press conference, DeWine repeatedly talked about the calculated, planned nature of the murders. In separate counts against each of the four major suspects, the indictments describe what was formally termed a pattern of corrupt activity, a felony of the first degree and seem to speak to the calculated conspiracy DeWine spoke of Tuesday, though each of the suspects also is charged specifically with conspiracy, a felony of the first degree. The conspiracy section of the indictment against George Wagner III, for example, talks in part about the suspect “making several purchases in the months leading up to the aggravated murders, murders and or aggravated burglaries, including but not limited to the following items: specific shoes from Walmart, ‘brass catchers,’ items with which to build ‘brass catchers,’ ammunition, a magazine clip, a ‘bug’ detector, and/or parts to build a ‘silencer(s), and/or various other items in preparation of these crimes” and also talks about construction of silencers, forging documents and “obtaining and sharing information regarding the victims and their properties in preparation for these crimes to include their habits and routines, sleeping locations, physical layout of properties, counter surveillance devices present on the properties, including pets; illegal monitoring of various social media outlets” as well as tampering with evidence up to and including allegedly moving the bodies of at least two of the victims. All six suspects currently are in law enforcement custody. No preliminary trial date was set as of Wednesday. Further, George Wagner III still was believed to be in Kentucky where he was arrested and is awaiting extradition to Ohio. The attorney general’s office concluded its press release with the statement an indictment is not evidence of guilt. The defendants are presumed innocent until proven guilty in a court of law. https://www.portsmouth-dailytimes.com/wp-content/uploads/sites/28/2018/11/web1_BCI.jpgThe Bureau of Criminal Investigation and Identification was at a house in South Webster last summer. 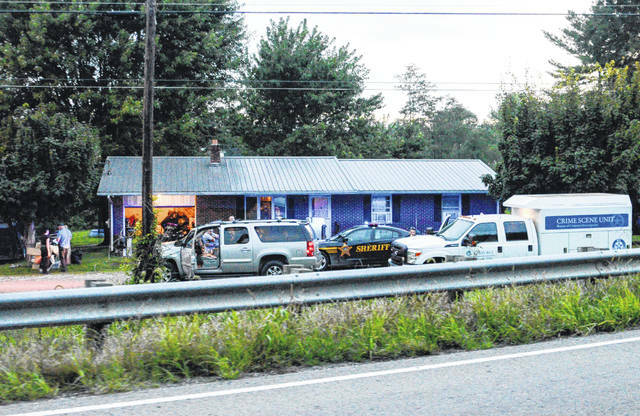 It is believed to be connected to at least one suspect who was arrested Tuesday in the Rhoden murder investigation.